I’m guessing that if you are reading this blog post, then your family is just as excited about the new Incredibles 2 movie by Disney that is coming out this summer. I know we are are stoked about it! Even my husband is counting down that days until it comes out. We feel like this sequel to the original Incredibles movie should have happened a long time ago, right? Anyway, you also may be here just because you like superheroes in general or at least you have a kiddo that does. 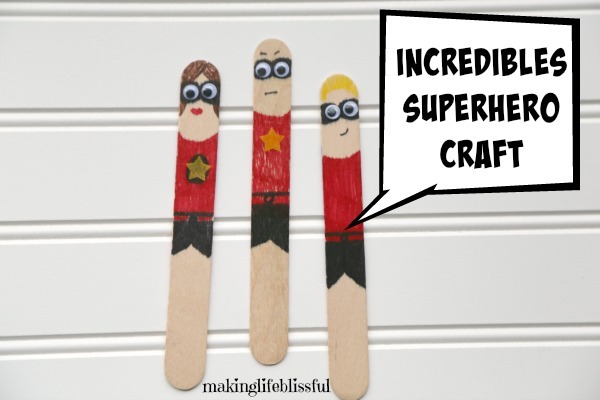 So here’s my idea for a EASY superhero craft for kids made with popsicle sticks. 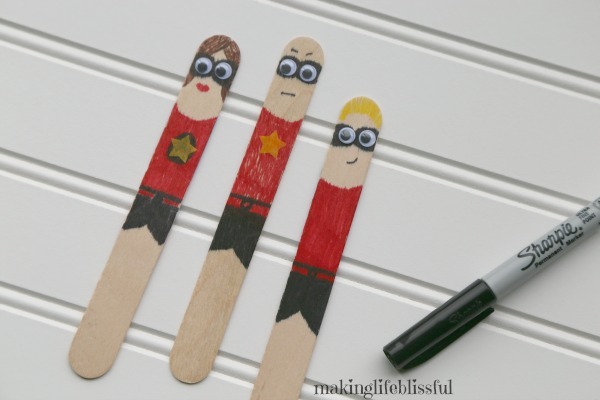 You can make the whole Incredibles family or any superhero whether it be Superman or Captain America. 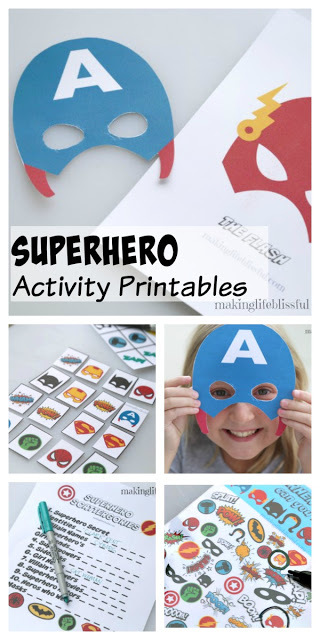 This makes a great Incredibles craft for birthday parties, retirement homes, or classrooms. 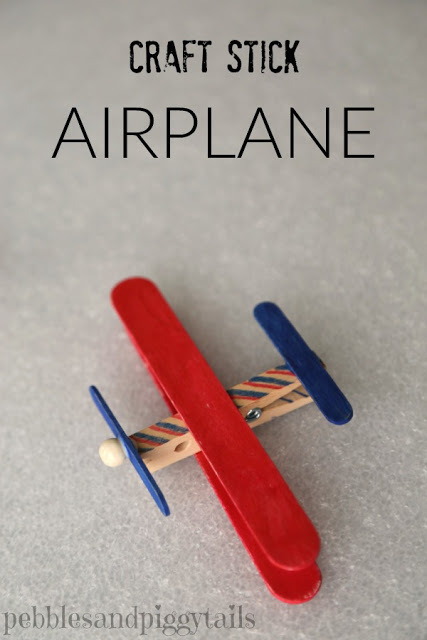 I also have an option for me to put all the pieces together for you in a craft kit (more info on that below). 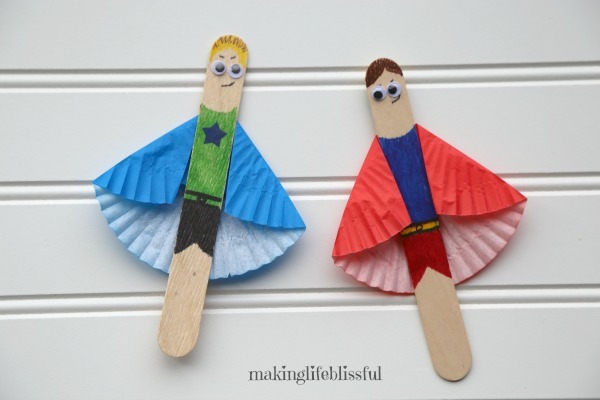 Either way, enjoy this superhero popsicle stick craft. 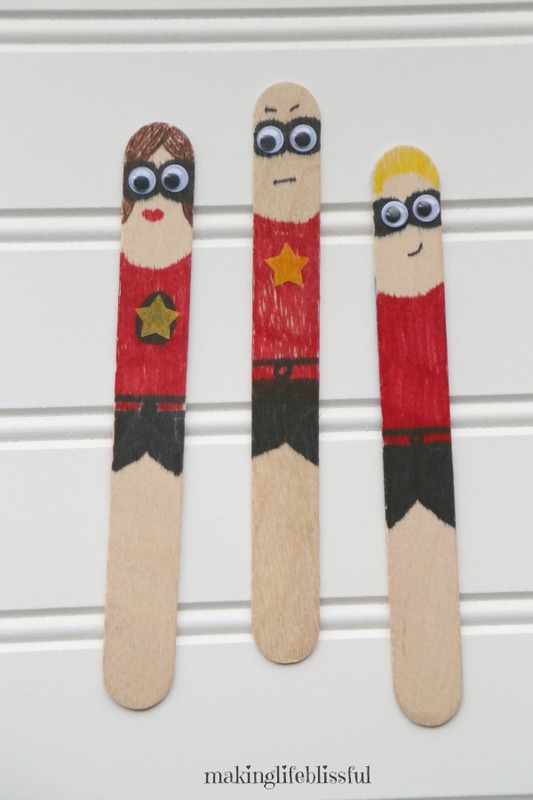 Create the whole Incredibles Family or any kind of superhero that you want! You can be as detailed or as un-detailed as you want (is that a word?). 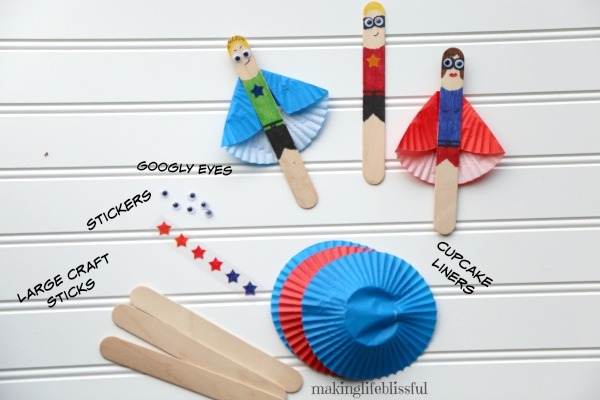 Isn’t this a cute popsicle stick Dash? These are the basic items you will need. 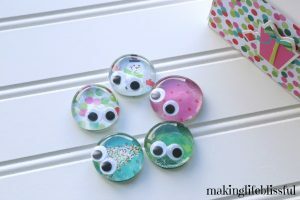 I also sell these in craft kits in my Etsy Shop and my blog store, if you don’t want to search for all the pieces, I can put them together for you and send them to you! Color on the clothes and hair using basic washable markers. Follow the designs I have used or make your own. The masks are just a rectangle black marker shape where the eyes should be. Then glue the eyes on top of the mask. Use a fine point Sharpie marker to add in the fine details. Add stickers as desired. If you want to make capes: spread open the cupcake liner and fold down the top 1/3 of the liner. Then fold in the 2 sides so it looks like a cape. 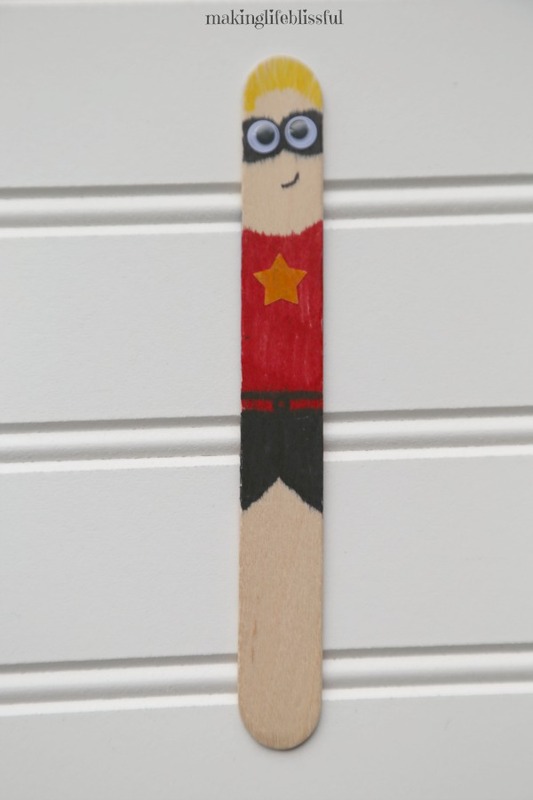 Glue the cape onto the back of your craft stick. 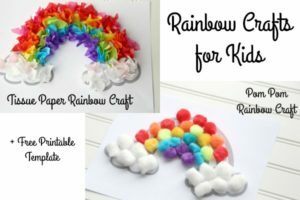 LET ME FIND ALL THE CRAFT ITEMS FOR YOU! My craft kits are very popular in my shop. 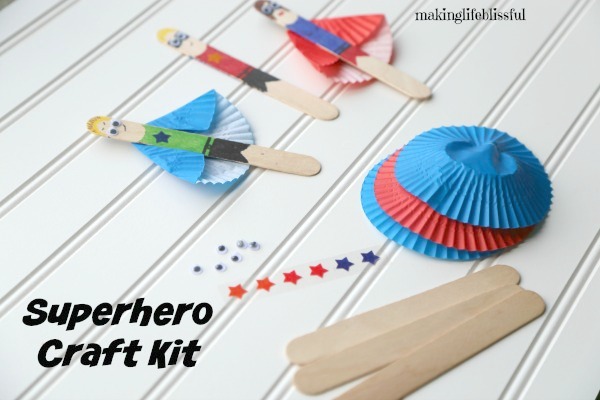 I can put together these superhero craft kits for you, so you don’t have to. 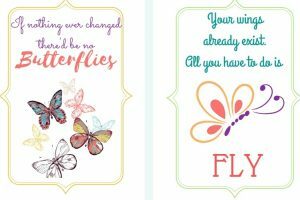 I’ll send them ASAP to you just in time for your crafting event! Perfect idea for birthday parties, classrooms, summer camps, or retirement homes. I take small orders and large bulk orders (discounts for bulk orders).